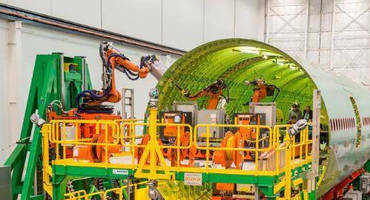 STERLING HEIGHTS, MI and AUGSBURG, Germany – When the Boeing 777X twin-aisle passenger jet goes into full production for its debut in 2020, each fuselage will be built using special advanced automation technology, the result of a collaborative effort by the airplane maker and the KUKA Systems Aerospace Group. The robotic pulse production line, known as the Fuselage Automated Upright Build (FAUB), will be the baseline manufacturing process for the 777X and prior to that, for assembling fuselages for current 777 models. It's the first time Boeing will use such technology to manufacture wide-body commercial airplanes. The pulse line uses guided KUKA robots equipped with end effectors manufactured by another KUKA company, Alema Automation, to do the riveting currently performed by workers using handheld tools. The robots will work on the forward and aft sections, installing up to 60,000 fasteners per 777 fuselage, quickly and with great precision. For KUKA Systems, the project is one of the largest it has undertaken in the aerospace sector. The company's roster of current aerospace projects includes the automated assembly of the center fuselage of a new jet fighter, an assembly line for a new super-medium class of commercial helicopter and robotic drilling platforms for a new, long-range business jet. They leverage the expertise in assembly line automation that has made KUKA Systems the largest supplier of production technology to the North American and European automotive industries. The FAUB system, which was pre-assembled and integrated at KUKA Systems in Sterling Heights, MI, is undergoing the final phase of testing and production readiness in a Boeing facility in Anacortes, WA. "This is a signature project for us, being able to join forces with such a global leader as Boeing," says Robert Reno, Group Vice-President, Aerospace at KUKA Systems. "Bringing KUKA's manufacturing and automation expertise to the aerospace sector is helping our customers realize important economies and efficiencies from technology that also delivers unsurpassed quality." KUKA Systems is an international supplier of engineering services and flexible automation systems for the Automotive, Aerospace, Energy, and Industrial Solutions segments. Some 4,000 employees worldwide work on ideas, concepts and solutions for automated production and the provision of products and services for virtually all tasks in the industrial processing of metallic and non-metallic materials. The range is presented and marketed internationally via the subsidiaries and sales offices in Europe, America and Asia. KUKA Systems had worldwide sales revenues of 1.1 billion euros for the 2013 business year. KUKA Systems North America LLC, based in Sterling Heights, MI, is responsible for the North American business and the worldwide aerospace group.